Turkey's President Recep Tayyip Erdogan says it has been given a jet worth around $500m (£380m) by Qatar's emir. Mr Erdogan said Sheikh Tamim Al Thani had donated the Boeing 747-8i to the Turkish state after hearing that it was interested in buying it. 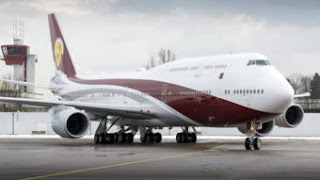 Opposition MPs had expressed concern that the president was using taxpayers' money to buy a jet as the country struggles to avert a financial crisis. Turkey has backed Qatar in a year-long stand-off with other Arab states. Saudi Arabia, the United Arab Emirates, Egypt and Bahrain severed all diplomatic and trade links with the tiny gas-rich state over its close ties to Iran and its alleged support for jihadists - a charge it denies. Turkey sent food by sea and air to prevent shortages in Qatar's supermarkets after its only land border was closed and ships serving it were banned from many ports.